I couldn't decide, at first, which button to use, but finally settled on this vintage orange one. It might look a bit dark in the pic but picks up the peach fleck in the yarn nicely. 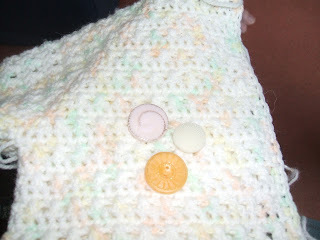 I thought it would end up a good bit bigger than the 0-3 months stated on the pattern and I was right. 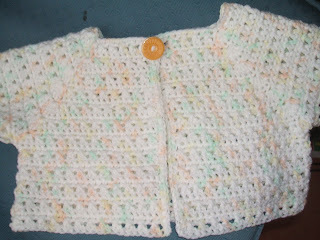 Using a 3.5 hook, it's about the same size as the previous blue scottie dog cardi (aged 2). I really liked the effect of the crossed double crochet, so continued it throughout the piece, rather than ordinary doubles for below the sleeves. I had less yarn than I first thought, so has a slightly cropped look, finishing at waist level. I'm a happy bunny though, and hope my little friend likes it, too. I'm now going to have a go at knitting a sheep so pop back later in the week to see how it's going. It's funny cuz I originally designed it with the x-stitch throughout but thought it might put people off as it's not a very fast stitch.What size do you think it turned out to be?